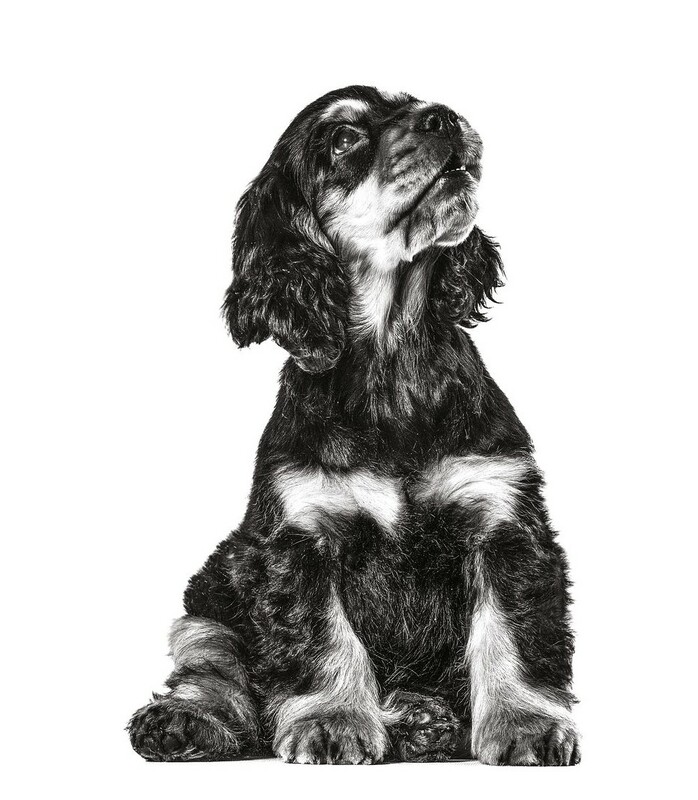 Learn about the Cocker Spaniel’s diet, health and history by reading this Cocker Spaniel guide – discover what makes this breed unique! The Cocker Spaniel gets its name from the job it was originally bred to do – to flush out woodcock on the hunt. Today, they are one of the most popular family dogs, a position earned because of their happy-go-lucky and enthusiastic nature – it is said that a Cocker’s tail is always wagging. A short and compact dog that is typically as tall at the withers as it is long – the withers is the ridge between the shoulder blades. A square muzzle and pronounced stop (the indentation between the muzzle and the forehead) gives it a classic appearance, and its eyes should be full, dark brown, bright, and merry. Its ever-wagging tail should be carried level and should be well feathered in line with the coat on the body and limbs. The rest of the coat is flat and silky; never curly. A vast variety of colours are seen in this breed, except for solid white. To help prevent excess Cocker Spaniel shedding, you will need to ensure that your Cocker Spaniel’s grooming takes place at least once a week. Energetic and full of life, the Cocker can run for miles – but is equally at home on an arm chair. They are robust when outdoors, particularly when following a scent, and will go through ground cover and water with abandon. This makes Cocker Spaniel training more fun and less challenging than training can be with other breeds. Their charm comes from a gentle, affectionate and social nature which makes them great companions (if you have the energy to keep up). The Cocker Spaniel puppy is charming and sweet; it tends to be enthusiastic and adventurous, but can be delicate too. The Cocker Puppy needs nutritional support for its moderately intense rate of growth and active personality, it also benefits from additional nutrients when it comes to their skin, coat and digestion – which can all be quite sensitive. Ideal Cocker Spaniel puppy food: ROYAL CANIN® Cocker Spaniel Puppy. In its adult years, maintaining the Cocker Spaniel’s silky coat and sensitive skin can be a concern. 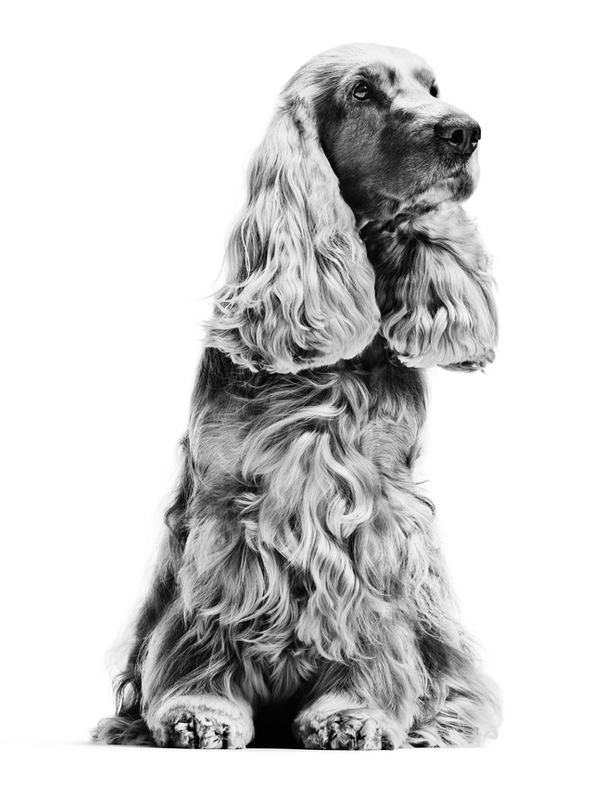 Tailored Cocker Spaniel nutrition can help to support the skin’s natural barrier function and help to maintain its health. Specific nutrients can also support optimum coat condition, with a balance of specific vitamins, minerals, amino acids and omega fats from soy, fish and borage oils. Owners of the Cocker should also be aware of their predisposition to weight gain. This predisposition is why, when you’re considering what the best dog food for Cocker Spaniels is, you should consider a diet that is moderate in fat and calories, yet at the same time supports their appetite (which can be picky) to help ensure that they feel satisfied and full after their meal. Ideal Cocker Spaniel Adult dog food: ROYAL CANIN® Cocker Spaniel Adult.